Bob Marley was a lover of football (some maintain he died as a result of a football injury) and we have incorporated the famous image of him playing the game in his own tracksuit and the Celtic sentiment ‘If You Know Your History’ into our badge design. We incorporated the colours of Jamaica and Celtic onto the badge. The badges are available for sale via PayPal – £5 including P&P for UK and North of Ireland. * Payment can be made via paypal to: theshamrock@outlook.com Please leave a note of your name and delivery address in the instructions section. 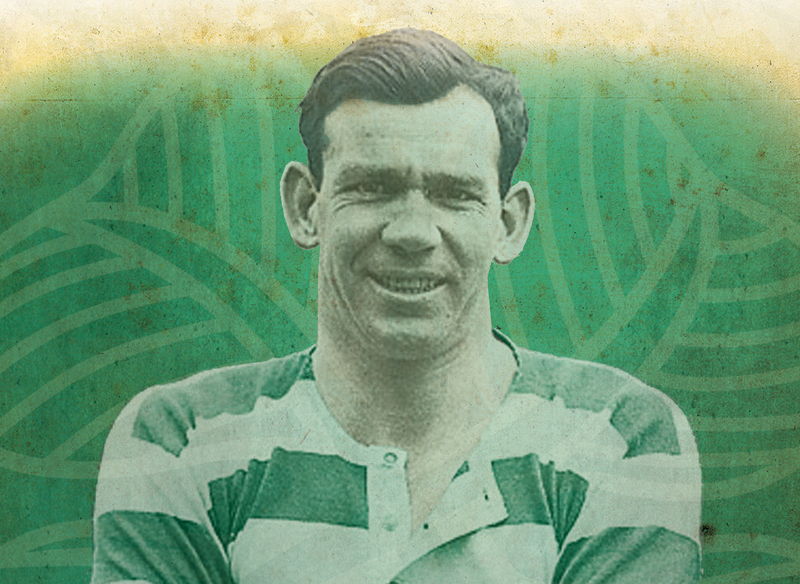 A Total Eclipse – Jimmy McGrory style! Today sees the long-anticipated solar eclipse in Scotland and beyond although, for the Celtic-minded, such occasions are not unknown through the club’s glorious unbroken history. It was ninety years ago, on 24th January 1925, when another solar eclipse was scheduled to take place during Celtic’s Scottish Cup tie away to Third Lanark in Glasgow’s southside. 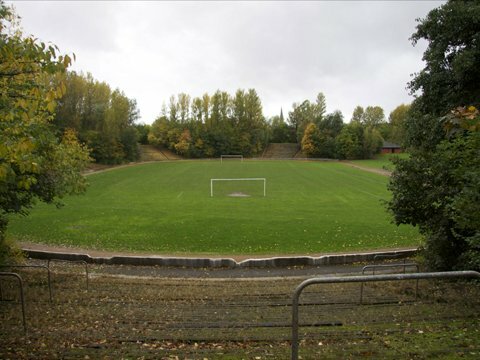 Cathkin Park, now long abandoned, was the main place to be in the city that day as ‘The Volunteers’ welcomed Willie Maley’s team. There was much excitement about the impact that a total eclipse might have on the game and spectators. This excitement was fuelled by the clear skies over Glasgow through the morning and early afternoon until, just thirty minutes before kick-off, clouds came from the south-east and the sun was largely blocked out from view for the next two hours. Glimpses of the eclipse could only be seen fleetingly in the city including the Observatory. This would likely have come as a disappointment to the inhabitants of the press box at Cathkin Park. Due to all the speculation about the potential impact of the eclipse, Third Lanark had arranged for members of the press to be furnished with candles in order that they could keep a watchful eye on the field while developing their match reports. In the end, the candles were unnecessary. It was hard to avert your eyes from the field to the sky in any event. The game proved a tremendous cup-tie . Thirds were the first to draw blood before Celtic managed an equaliser just before half-time. Celtic then took the lead early in the second half and, when it looked as though Thirds were about to peg them back from the penalty spot, the missed kick spurred Celtic on to seize the initiative and they went on run out 5-1 winners. 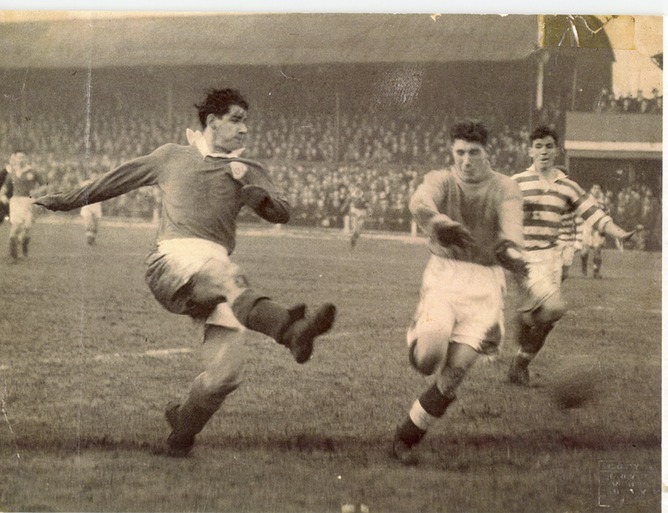 The Garngad’s finest son, Jimmy McGrory, scored 4 of the Celtic goals himself – and victory was secured thanks to his deadly accuracy in front of goal and the sterling support he received from Adam McLean, Patsy Gallacher, ‘Jean’ McFarlane and Willie McStay throughout. Thirds were well and truly eclipsed by the man dubbed ‘The Human Torpedo’. Solar eclipses have traditionally been considered bad omens in some cultures and the cause of widespread fear and sometimes panic – a harbinger of death, destruction or disaster. The eclipse which took place on 24th January 1925 was no exception and a couple of incidents took place immediately after the Third Lanark-Celtic match which would have had more than a few fans reaching for their rosary beads or – more likely – a pint of some very strong stuff indeed. With a crowd of over 42,000 in attendance at Cathkin Park nearby Crosshill station was packed as a number of football specials ferried fans back into the city centre. One of the special trains – carrying over 800 supporters – failed to stop as it travelled along Platform 9 at Glasgow Central station and crashed into the buffers. The 12 passenger coaches which made up the train smashed together with some being thrown into the air. A major rescue operation was quickly underway. 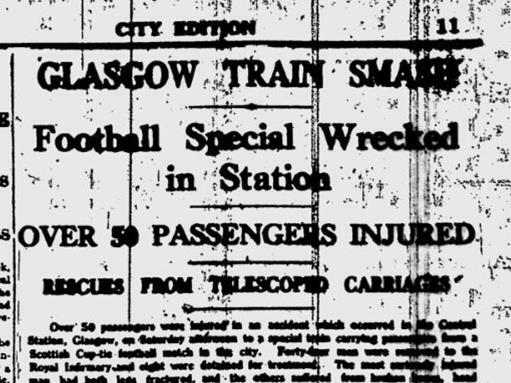 The initial scene of carnage was described in the Glasgow Herald: ‘The groans and screams of men in pain issued from the wreckage . . . men were pinned in the midst of this debris and hatchets and crowbars had to be used to secure their release. It was a difficult and harrowing task and probably none expected that all the captive sufferers would be extricated without a single one among them bearing mortal injury.’ Many onlookers felt it was a miracle that there was no loss of life. Over 40 supporters were finally freed from the wreckage and ferried to the Royal Infirmary for emergency treatment. It later emerged that the worst injury was to an individual who broke both his legs in the crash. The second incident was more minor in nature but was a cause for genuine concern for those caught up in it and those who witnessed it. 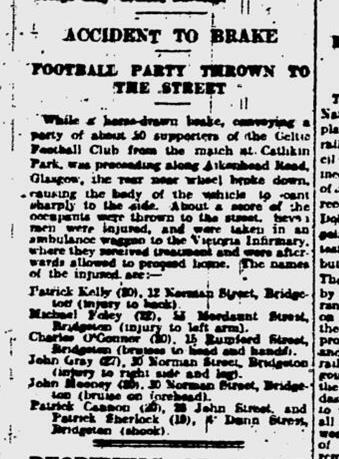 A Celtic brake club travelling back to Dalmarnock after the game was involved in a nasty accident on Aitkenhead Road when the back wheel of the horse-drawn carriage broke without warning, throwing more than 20 supporters onto the road and the path of other traffic. Six were taken to the nearby Victoria Infirmary for treatment. Fortunately, when the day was over, no lives had been lost and the eclipse was gradually forgotten. Celtic moved on from their triumph over Third Lanark all the way to the Scottish Cup final at Hampden where, thanks to one of the most amazing goals witnessed by football fans anywhere, ‘Peerless’ Patsy Gallacher introduced gymnastics to the six-yard box and – with the ball trapped between his feet – somersaulted beyond the Dundee goalkeeper and into the net to secure a vital equaliser. This sensational goal was to pave the way for Celtic victory – McGrory netting the winner with one of his trademark headers – and the return of football’s oldest trophy to Celtic Park yet again. 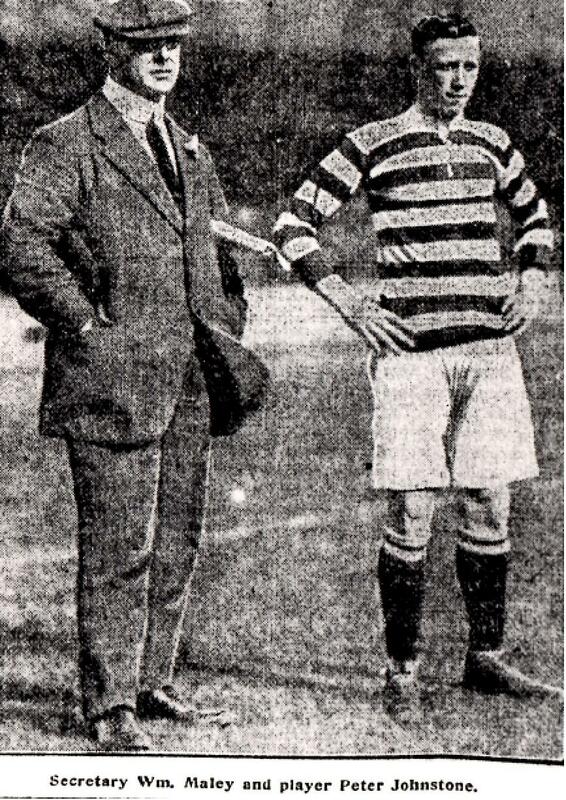 Maley’s Bhoys of 1925 vintage were truly a Grand Old Team to see – in hail, snow, sun or even eclipse. The Ballingry Celtic Supporters Club in Fife are at the forefront of a campaign to build a memorial garden in honour of one of Celtic’s great tragic heroes – centre-half Peter Johnstone. 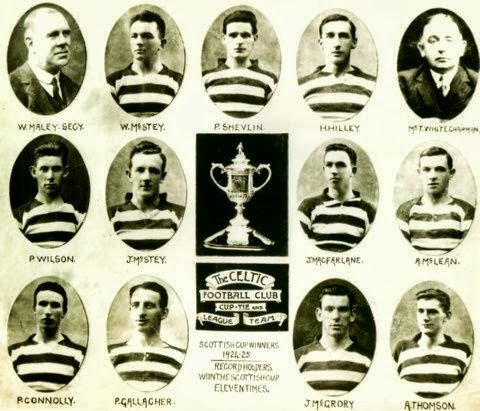 A team-mate of the mighty Jimmy Quinn, Alec McNair, Sunny Jim Young and Patsy Gallacher, Peter won an impressive 4 championship medals, 2 Scottish Cup medals, 3 Glasgow Cups and 4 Charity Cups in his eight years at Celtic Park before he volunteered to fight at the front in World War 1. He was reported missing, presumed dead on 16 May 1917 and his body was never recovered. 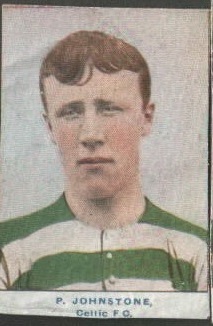 Peter came from the village of Glencraig in Fife and played for the village team – Glencraig Celtic- before Willie Maley signed him for the better known Glasgow version. He was a hugely popular player in his time in the Hoops. The plans for a memorial garden in Glencraig are now well advanced. There is still an opportunity – for the next 2 weeks only – for supporters to help this great project and ensure that Peter’s memory is marked for the first time officially in his community buy buying bricks that will be used to form the walls for the memorial garden. The site contains information about Peter’s life, career and tragic ending. 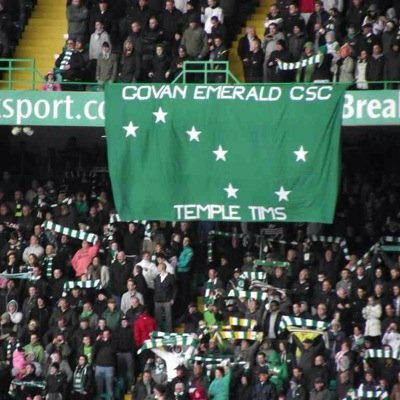 Govan has long been a Celtic stronghold and home to a number of Celtic supporters clubs down the years. The Govan Emerald CSC, based at the Tall Cranes pub, has been the main Celtic bus in the area in recent times and is well-known throughout the support. Whether it’s celebrating a Celtic title win outside the front door of Ibrokes, helping themselves to banners belonging to Rangers Ultras (the ones who like to ‘party all the time’!) 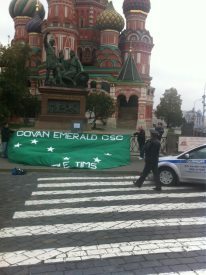 or getting their flag out at the Kremlin to the dismay of Russian security services, it’s fair to say that the Govan Bhoys (and their partners in crime the Temple Tims) are not known as shy, retiring types. 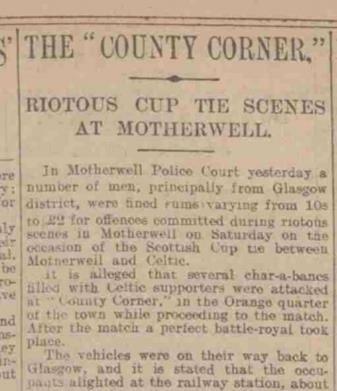 The well-earned reputation of the Govan Bhoys in the forefront of the Celtic support goes back over a century, as revealed in this newspaper excerpt from 1914 about Celtic’s trip to Motherwell on 7th March for an important Scottish Cup quarter final. Celtic were fighting it out for both the Cup and League Title at the time and a then-record crowd of 18,000 turned up at Fir Park to witness this crucial tie. 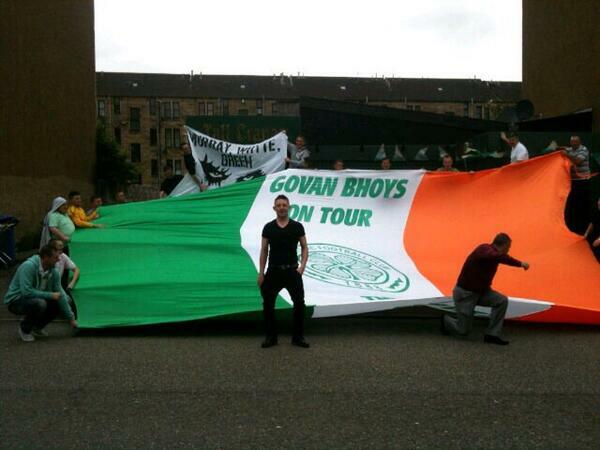 Some Celtic fans didn’t have to wait to get the ground before the action started. As the Daily Record and Mail reported a week later “several chara-a-bancs filled with Celtic supporters were attacked at “County Corner”, in the Orange quarter of the town while proceeding to the match.” This happened near the railway station in Motherwell close to Milton Street where an Orange hall still stands today, home of the musically-and-sartorially-challenged County Flute Band. News of the ambush didn’t go down well with Celtic supporters at the game. After watching their team secure a convincing 3-1 victory, the Celtic brake clubs assembled en masse and headed back to where some of their number had been attacked earlier in the day. In the words of the news reporter “a perfect battle-royal took place”: The vehicles were on their way back to Glasgow and it is stated that the occupants alighted at the railway station, about 300 yards from the scene of the incident which took place before the match started. It was alleged that they had their pockets filled with stone and bottles. Waving green flags they marched on “County Corner” in a body’ . . . Stones, sticks and bottles were thrown in all directions and many hand to hand conflicts took place. 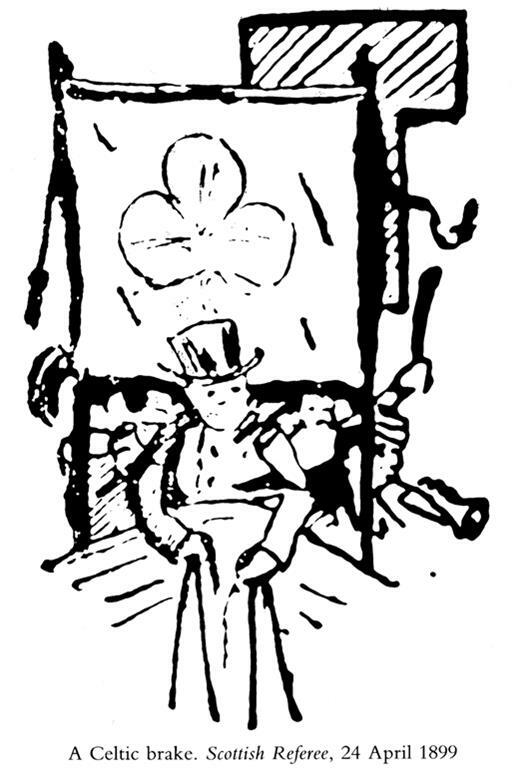 As the riot unfolded, a police constable later reported that he saw a Celtic supporter leave a brake with a flag in his hand shouting “Dirty Motherwell; come away Celtic!” The flag, which was used as a weapon and fought over by both sides in the melee, was last seen as a production in the criminal proceedings that followed: One of the productions at the court was a Govan Celtic Brake Club flag which was used in a fight in Muir Street. A man, who was apprehended with the flag in his possession, was charged with having behaved in a disorderly manner . . . The accused had the flag in his hand laying around him in an indiscriminate manner. Constable Dunlop said there were hundreds in the crowd, and the accused was laying about him for all he was worth, and the crowd was so dense that he could not miss hitting. The newspaper report reveals that one local man and a Govan man were both sentenced to a penalty of 20 shillings or the option of ten days imprisonment for their part in the disturbance. They got off lighter than the Celtic fan who ended up taking on the police as well as the Orangies that day: When taken into custody for having used obscene language he tripped up the constables and kicked them, and three civilians had to come to the aid of the officers. A fine of £2 with an alternative of twenty days imprisonment was imposed. MacLean got up at the meeting and attacked Carson, and the whole line of the British in Ireland – the scandalous use of the Black and Tans, the whole concept of Britain’s interference and savagery, the use of Scottish troops. He made special reference to Northern Ireland, Carson, and the Orangemen. The audience was getting more and more out of hand. The shout got up, “Up Derry!” The crowd rushed in. The platform went over. We had visions of an awful lot worse happening. But while there had been a concentration of supporters of Carson to have a go at Maclean, his open advocacy of support for the struggle in Southern Ireland for the Sinn Fein led to a counter shout of “Up Dublin! Up Dublin!” It was the first time I had heard it. Irishmen and Irish connections from all over Lanarkshire had come in to protect Maclean in this Orange stronghold. 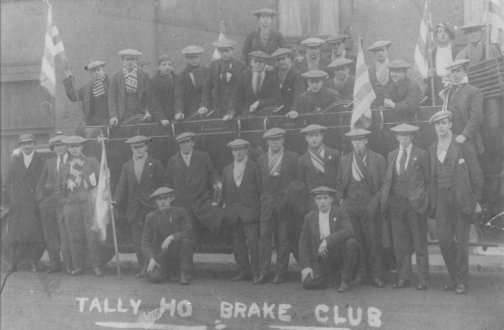 There was a rally by the “Up Dublin!” boys that pushed the “Up Derry!” boys back and they put a solid phalanx around the platform and said to Maclean, “Go on John, we’ll see that you get leave to speak.” It finished up an extraordinarily successful meeting. That was the second occasion in contemporary times when Orange bully boys didn’t get things all their own way in Motherwell. The Govan Bhoys and their comrades had the last laugh as Celtic went on to win the Cup, beating Hibs 4-1 in a replay then two days later beating Hibs again (3-1) at Celtic Park to claim the League flag and an auspicious Double. The Govan Bhoys would have undoubtedly celebrated Celtic’s Double in style just over a century ago. Whether they did so at the front door of Ibrox is not recorded in the newspapers of the day. 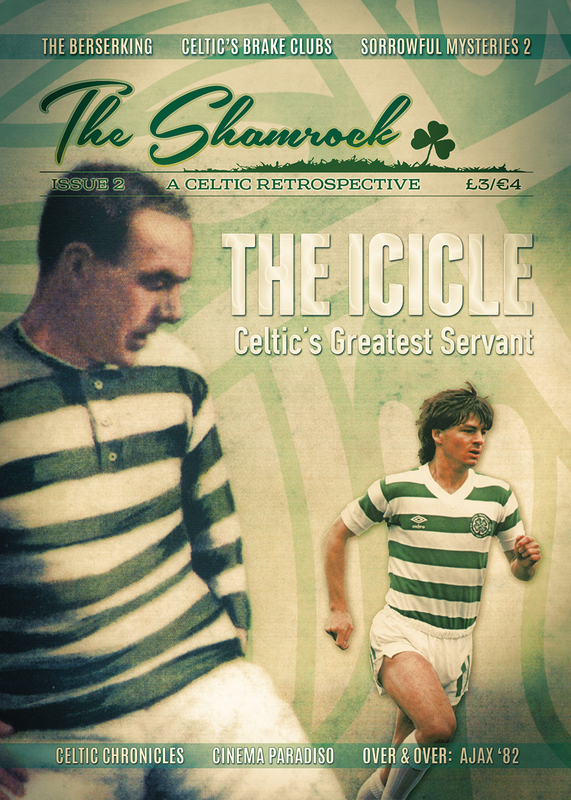 On Sale now: lssue 2 of The Shamrock – Celtic Retro fanzine. 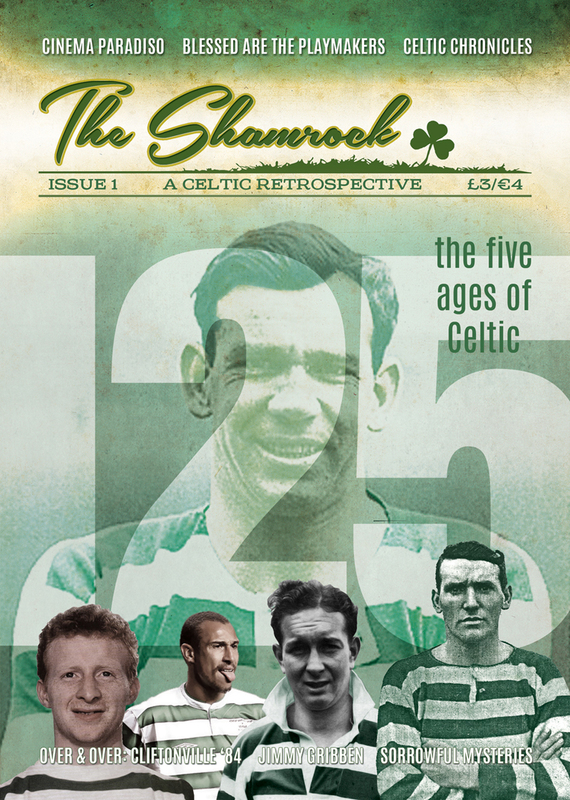 With articles on the legendary Alec McNair (known throughout his two decades in the first team as ‘The Icicle’), The Madness of Sir Bob Kelly, Ajax ’82 and the magic of Champagne Charlie, the Celtic Chronicles, the Rise and Fall of the Brake Clubs and The Berserking – a musical masterpiece born from the ashes of Celtic’s most despairing European performance. And those are just for starters . . .